Ann Coulter has been actively working against the body of Christ in manifold ways for nearly two decades. Now, she would condemn tens of thousands of Middle Eastern Christians to torture and death – for being Christians – simply to promote her own book and her ideas on immigration. In fact, Coulter would deny refugee status to the very people those laws were designed to protect: people persecuted for their faith. In that respect (as in many others), Coulter emulates Obama, who, likewise, denies refugee status to Christians suffering persecution, indeed, genocide, in the Middle East. Coulter claims that it’s impossible to only give Christian Syrians refugee status and insists, “We’re not letting in the Christian Syrians. We’re cutting it all off.” Coulter falsely claims, “The asylees and the refugees are 100% fraudulent.” 100%? Coulter has examined every case? Coulter insists that she would not admit Christian refugees who are fleeing persecution. Why? Because, “We are not a battered women’s shelter.” But America’s refugee laws are explicitly and expressly designed to protect people persecuted for their faith. 1) Refuge laws exist to protect people persecuted for their faith; 2) Coulter admits Christians are being persecuted for their faith; 3) Coulter would deny those persecuted Christians protection. John Nolte at Breitbart News notes, “Despite President Obama’s sanctimonious proclamation Monday that America does not have a religious test when it comes to admitting refugees into America, the actual math appears to show the complete opposite is true. According to CNSNews.com, who looked at the data, only 53 Syrian Christian refugees have been allowed into America, compared to 2,098 Syrian Muslims.” The Obama administration is perversely permitted entry to Muslims (who are not undergoing systemic persecution) but denying entry to Christians (who are experiencing genocide). Christian genocide in the Middle East is on the rise as Islamists seek to create a global caliphate. The Islamic State has seized large amounts of territory and operates with impunity in many nations. Islamists seek the eradication of Christianity and they do so in the most grotesque manner possible. Nina Shea, the Center for Religious Freedom, says that Christians have been forsaken and abandoned in Syria and Iraq. Shea recommends viewing “Sing a Little Louder,” a video which cautions against the perils of ignoring genocide. “ISIS atrocities against Christians became public in June 2014 when the jihadists stamped Christian homes in Mosul with the red letter N for ‘Nazarene’ and began enforcing its ‘convert or die’ policy.” ISIS pursues that policy with the ruthlessness of the Gestapo. Open Doors reports that every month, “322 Christians are killed for their faith, 214 churches and Christin properties are destroyed, and 772 forms of violence are committed against Christians.” Iraq and Syria are ranked third and fourth among nations persecuting Christians. Those are the refugees Coulter callously dismisses as unworthy of aid. For over 16 years, Coulter has attacked Christians for being Christian. Coulter gets upset with Christians who actually live their lives according to their faith. Coulter has called pro-life Christians “fascists” and “cowards” for pursuing a pro-life agenda. Coulter has defamed Christians missionaries as “traitors” and publicity hounds for doing humanitarian work and promoting the gospel overseas. Coulter asserts that Christians who oppose Trump are bossy, proud, and seeking validation from liberals. 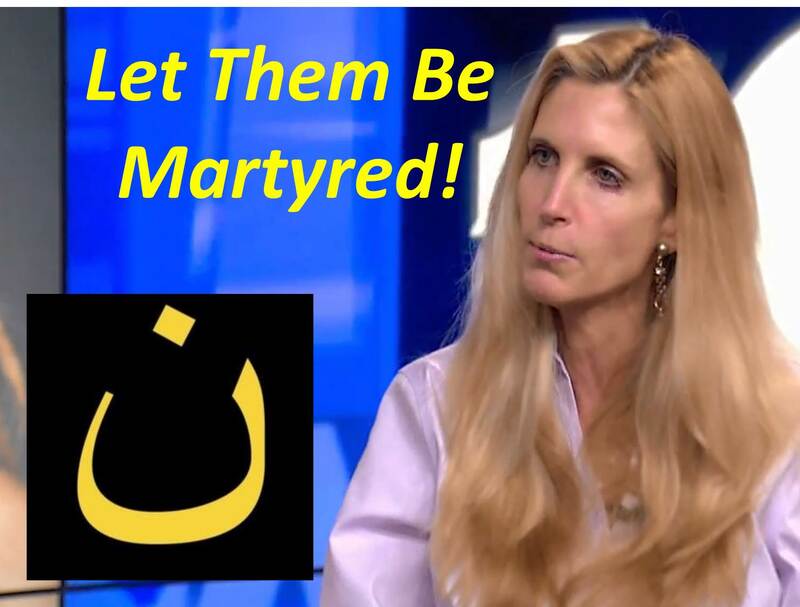 Now, Coulter would watch Christians die by torture and massacre – all in pursuit of her political agenda. 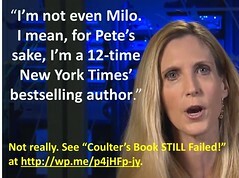 Ann Coulter is about as Christian as Barack Obama. Ann Coulter, The Drive Home, KABC, 11/19/15. Ann Coulter, John Gibson Show, Fox News, 11/14/15. Ann Coulter’s entire column this week was specifically designed to be a wet blanket to the firestorm of ISIS coverage because she wants the entire conversation to be about immigration. Hence her denial that ISIS poses a threat to America. Emulating Black Lives Matter, which was so incensed at innocent Parisian victims stealing their spotlight that they expressed profanity-laden hatred toward them, Coulter is irate that people are concerned about ISIS and refugees at the expense of her own pet cause – immigration. It does not matter to Coulter that France experienced its own 9/11 or that ISIS has proven both its intent and ability to inflict monumental harm on the West in its pursuit of establishing a global caliphate. Coulter’s column reeks of anger. Why is Coulter so angry? Coulter evinced no shock, horror, or outrage at this horrific tragedy besetting innocent people. Instead, Coulter expressed contempt for those people. Even as civilians were dying, Coulter attacked the French people who were being slaughtered by Belgian terrorists. Coulter’s anger, like that of Black Lives Matter, arose for precisely the same reason: the Paris terror attacks took the spotlight away from what she cares about – the only thing she cares about – immigration. As the Paris attacks unfolded, Coulter retweeted twice. Her first: “If France responds appropriately, they’ll be called fascists. If they don’t, the fascists will keep murdering them.” As it turns out, the French responded appropriately. Coulter’s first tweet was in response to “Gunmen shouted ‘Allah Akbar’” – she tweeted: “But it would be too expensive to deport them. That’s not an ‘adult’ solution.” Even at the beginning, Coulter was obsessed with immigration! How does one say “Illegal immigration is an act of love” in French? HOW DID THIS HAPPEN? French people ran onto the street with signs that said, ‘Je Suis Charlie’! Why didn’t that stop this? Obama just canceled a speech about closing Gitmo. Too bad there were no concealed carry permits … anywhere in Europe … since 1818. What’s the upside of letting millions of Muslims migrate to western countries? 100% of TV talk is @ fighting ISIS–IN SYRIA. Bomb away, but isn’t there something else we should consider? Like not letting ISIS move here? Why does NO ONE say the obvious thing on TV?! It’s insane. Don’t want terrorism in US? Stop importing Muslims! All year long, Coulter denied the Islamist threat that ISIS poses to Americans. To this very day, she still denies it. Coulter denies the existence and work of ISIS in the American homeland. Al-Qaeda morphed into ISIS. In that sense, ISIS is Al-Qaeda by another name. 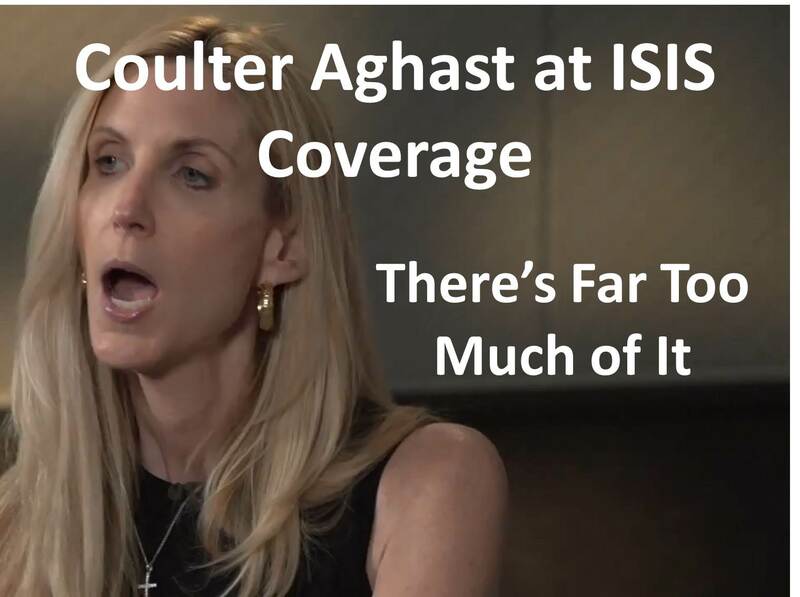 It is preposterous to insist, as Coulter does, that ISIS is not here in America. It has been since before 9/11. To suggest otherwise is ludicrous. Sorry, Ann, but Al-Qaeda was ISIS in embryonic form. Other domestic terrorists have been inspired by ISIS. In just the past year, 72 U.S. residents have been arrested on terrorist-related charges. Moreover, ISIS sleeper cells have been planted in America for years. With the abdication of American leadership on the war on terror, France stepped up to the plate. Consequently, France has been the target of multiple attacks by ISIS (many of them, fortunately, thwarted). The terror cell which conducted the Paris attacks was also responsible for at least four previously foiled terrorist attacks and had been planning many more. Today, Islamic terrorists have seized a hotel in the former French colony of Mali, killing at least three and seizing about 170 hostages, some of them American. ISIS intends to subdue all opposition to its globalist plans and it currently sees France as its greatest threat. It seeks to takedown France as an object lesson to every other Western nation. If France is deterred, who in the West will be left to combat Islamist aggression. Ann Coulter has proven herself nothing more than a partisan hack, self-promoter, and shill for Donald Trump. Not that long ago, Coulter insisted – against all reason, logic, and evidence – that Islamic jihadists posed no threat to the American homeland. 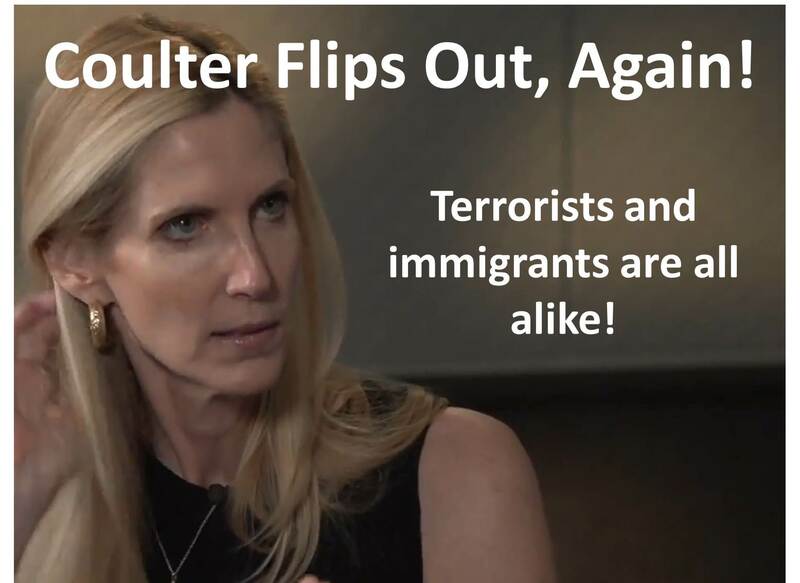 Now, Coulter claims that immigrants are just like terrorists. The pacifist Left rejects the very existence of Islamic terrorism, while, since 9/11, Coulter proclaims “all terrorists are Muslim.” Now, Coulter adds immigrants (non-Muslim as well) to the list. This is particularly surprising since Coulter claims 20-plus years studying immigration and has spearheaded a jihad against jihadists since the Twin Towers fell. In her deliberately obtuse column this week, Coulter made some startling assertions. First, Coulter denies Islamic jihadism in America. Coulter’s denials of the Islamist threat in America preceded the publication of her latest book, continued throughout her book tour – even after jihadists attacked a cartoon contest – and she continues to dismiss the truth that the FBI is conducting ISIS-related investigations in all 50 states! Coulter follows the Obama administration’s penchant for playing semantic games, distinguishing between various jihadist groups (was it ISIS, ISIL, Al-Qaeda, some other outfit), when they are all part of the same Islamic jihadist paradigm. They are all fighting for the same cause, seeking the same goal – an Islamic caliphate. Yet, Coulter writes: “Not to be a stickler, but ISIS didn’t slaughter 3,000 Americans on 9/11, blow up the Boston Marathon, murder thirteen Americans at Fort Hood, or open fire on a military recruiting center in Chattanooga, Tennessee.” But, they were all Islamic jihadists! Second, Coulter continually conflates immigrants with terrorists, as if they were the same. In yesterday’s column, Coulter repeatedly dismisses ISIS and again insists the threat to America is from immigration. Her column title, “When the Third World Attacks!” misses the point: Westerners were not attacked by the Third World; Westerners were attacked by Islamic jihadists. Coulter, an adept propagandist, uses the Paris terrorist attack to stigmatize all immigrants (mostly from non-Muslim origins). Coulter argues, that “50 years of the most backward, dysfunctional cultures pouring into the civilized world” have led to attacks by “immigrants” (not terrorists!). She claims: “second-generation immigrants are just as likely to shoot up Fort Hood as the first-generation Tsarnaev brothers are to blow up the Boston Marathon.” She calls these terrorists first- and second-generation immigrants to denigrate all immigrants. Coulter decries the “endless flow of Third World immigrants” and “Stone Age people,” glossing over the realty that it is a particular group of Third World immigrants which is responsible for terrorism. She makes the further claim of all immigrants: “We can’t assimilate them.” Again, Coulter is wrong. Many immigrants assimilate quite well in a nation which they love, even despite all the efforts of multiculturalists to turn America into a salad bowl instead of a melting pot. Identity politics is a major problem in this regard and Coulter embraces it with fervor. Moreover, Coulter fails to discern what makes these Islamists unique. Coulter comes close to the truth when she writes, “The Paris terrorists were 100 percent Middle Eastern, although most were born in Muslim ghettos in Europe.” But she again misses the point: Muslim enclaves are unique among those groups which self-segregate. They espouse anti-Western and anti-Jewish sentiments as they teach Wahhabism in classrooms and preach it in Mosques. From childhood, whole communities are immersed in this virulent ideology. That makes them different from other immigrants. That turns them into terrorists! 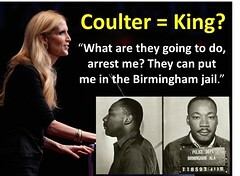 For nearly two decades, Coulter has promoted racial profiling to catch religious extremists. Now, to target terrorists and criminals, Coulter wants to profile all immigrants (first, second, and, perhaps even third generation). Coulter attacked native-born Gov. Nikki Haley for being an “immigrant” and contends that “all immigrants are bad.” In her column, Coulter defends xenophobia, because she is herself a xenophobe. Unrestrained hyperbole helped launch Coulter’s controversy-packed career and it may well spell its demise.